It’s a religion of peace. 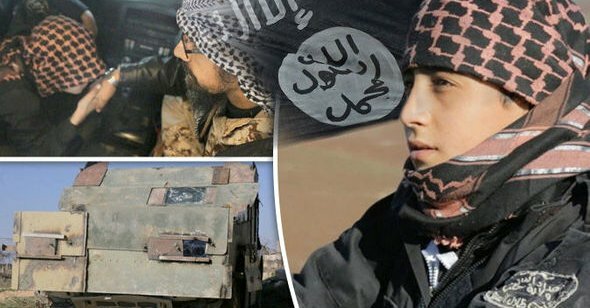 ISIS father sends 11 year-old son on a suicide mission. A PHOTOGRAPHER with the Islamic State (ISIS) captured the horrifying moment a child suicide bomber kisses his father goodbye before ramming his truck into Syrian soldiers killing himself and them instantly. The youngster, who appears to be aged around 11, is identified as Abu ‘Imara al-‘Omri in an ISIS propaganda shot which boasts how the boy helped them wrestle back control of the village of Ghazl near Aleppo, in Syria. The shocking images show the primary school age child toting a gun and gazing wistfully into the distance, while another shot shows his fortified truck, which would be packed with explosives, and reinforced to defy a hail of bullets from desperate troops trying to ward off an attack. The final photograph shows young Abu, sitting inside the dark truck, kissing his father’s hand as readers are told he received his blessing ahead of the suicide mission.